Connecticut Gov. Ned Lamont has revealed that an updated plan for toll roads in his state will involve no more than 50 tolling gantries, fewer than had been proposed in an early plan. Lamont and the co-chairmen of the General Assembly’s Transportation Committee, Sen. Carlo Leone and Rep. Roland Lemar, recently provided an update on the tolling proposal, which has been a point of contention amid constituents, freight haulers and other lawmakers. In a press release issued April 10, Lamont stated that the tolling gantries will be posted along interstates 95, 91, 84 and the Merritt Parkway, and will be stationed about every six miles. This figure marks a drop from earlier iterations of the plan, which suggested more than 50 gantries. The purpose of the tolls is to raise money for infrastructure projects to address congestion. Lamont claimed that 40% of the revenue from tolls will be generated by out-of-state drivers. Travelers pass through Connecticut when moving between New York City and Boston, and the proposal aims to capitalize on these drivers. The plan offers discounts for Connecticut EZ-Pass holders and “frequent drivers” who regularly travel on major roadways. Leone, a resident of Fairfield County, said he frequently is surrounded by out-of-state drivers. Fairfield County is located in the state’s southwest region, directly north of the state’s border with New York, and has I-84, I-95 and the Merritt Parkway running through it. Connecticut’s Office of Policy and Management estimates that many projects, including $30 million in Town Aid Road municipal grants, are in jeopardy if the state doesn’t secure more infrastructure funds. Lamont’s tolling plan is a shift away from an earlier plan that suggested tolling only trucks. At a public hearing hosted March 6 by the Transportation Committee, OPM Secretary Melissa McCaw emphasized that the truck-only plan is not practical because it would raise only about $200 million, while the option that includes cars and trucks would generate about $800 million. 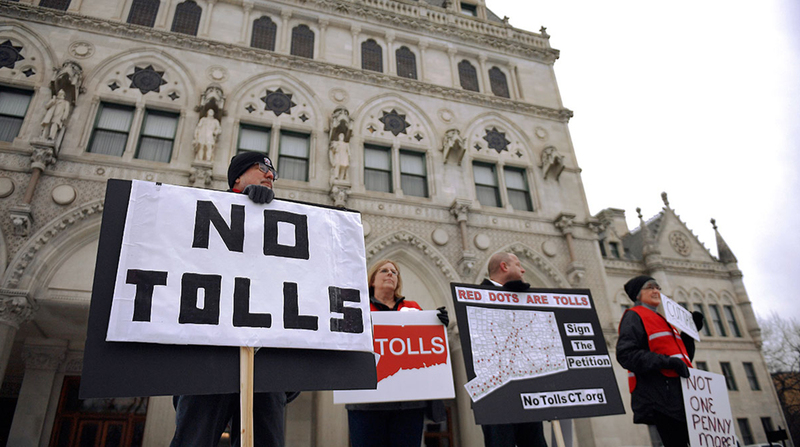 Most toll opponents have argued that Connecticut lawmakers couldn’t be trusted to properly use revenue created through tolls, despite a recent lockbox measure meant to ensure that transportation revenue is used only for transportation-related purposes. “The fact is that transportation infrastructure has been a legislative priority for many decades, but partisan politics have gotten in the way of making real progress and we are at a tipping point where we must act before it gets worse,” said Lemar, who represents New Haven.